● Dvar Torah: 10:50am - Rav Dov. ● Knowing the BA Families - 11:15am - After Tefila we will have a special Shabbat talk with Etty Bar-Shai about her grandfather and her Persian-Israeli-American life experience. ● Kiddush: 11:30am. Kiddush this shabbat is sponsored by the Bar-Shai family in celebration of Tzvi's 68th birthday (1/1); Dolev's 6th birthday(1/24); Etty & Tzvi's 43rd wedding anniversary (1/29); and giving thanks to Hashem for Tzvi's successful surgery and speedy recovery. ● Before Minha Parsha Limud - 4:00pm: VaEra. ● After Minḥa Mila baParasha: Understanding a word in our parasha. This week: "תּֽוֹעֲבַ֥ת מִצְרַ֛יִם - To’avat Mitsrayim" - What does the word mean; how “to’eva” relates to animals; and were the Egyptians vegans? Basic (and love of) Hebrew is sufficient. ● Kiddush: 11:30am. Potluck Kiddush this shabbat. Let’s make it happy. All processed foods must be store-sealed marked kosher. ● Before Minha Parsha Limud - 3:30pm: Shəmot. ● After Minḥa Mila baParasha: Understanding a word in our parasha. This week: "עִבְרִיֹּת - ‘Ivriyot" - What does the word mean; how it became Hebrew; and what is the connection to Yael Trump-Kuschner? With Rav Sh’muel. Basic (and love of) Hebrew is sufficient. Next Friday Night, Jan. 27th, Dinner with BA @ the Bayit Tent. January 27 - Next Erev Shabbat @ 6:00pm! * Keeping our tradition we will join the Bayit Tent for Erev-Shabbat Meal. We will celebrate with the Friedmans their marriage anniversary! 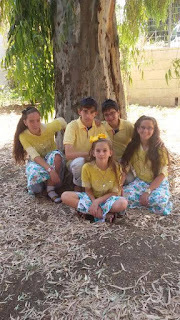 We will remember Goldie Guttman z"l.
Further sponsorships are welcome and needed! So if you have a special occasion, please let us know. Great opportunity to meet the BA Community @ the Bayit. ** Must RSVP. Check your email for Evite. $12 adult. $6 child (age 4-11). The Dinner is followed by the famous Bayit Cholent Cook Off. There are 12 cooks, 2 of which are from Beth Aharon! The names are kept in secret till after the competition. We need one more rep from Beth Aharon! There are 4 judges, one off which is from Beth Aharon - the one and only, Amnon Michaeli. So, next erev shabbat we are all coming! Remember to RSVP at the Evite. ● Kiddush - 11:30am: Kiddush is co-sponsored by Plonit and by Yael & Ari Oshinsky in celebration of Ari’s birthday. ● Before Minha Parsha Limud - 3:40pm: Vayhi. Binyamin and his blessing. ● After Minḥa Mila baParasha: Understanding a word in our parasha. This week: "וַיַּֽחַנְט֥וּ - Vayahantu" - What does the word mean; is it a Jewish practice; what were other biblical era burial practices; and why do we put stones on graves? Basic (and love of) Hebrew is sufficient. ● After Minḥa Daf baTalmud: Daf Yomi with Rav Dov Linzer on 3FL. Bava Metsi’a. ● After Minḥa Shiur baHayim: Shiur at the Main sanctuary. : "People-to-People, Our Way" by Kaleidoscope founder Chana Zweiter. Support Team Sean @ Chai Lifeline. 1 Week Left! In the last few years 2 of Beth Aharon kids diagnosed with cancer. With the help of doctors, community and Chai Lifeline, they are now cancer free! Now it is time to give back! Please help us to raise funds for the continuing work of Chai Lifeline. On Sunday, January 29, 2017 We will be running/walking the Half Marathon with Team Sean along with Team Lifeline, in Miami, Fl. Every dollar is count! Your donation is 100% tax deductible! Looking forward to a wonderful, meaningful race! Support the Roth Family in Israel during this Month! We are raising funds for the Roth family through Yad Eliezer. 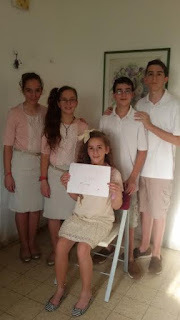 The 5 Roth children are raised by a single mother and live in Jerusalem. to facilitate their ability to stand in their own two feet. Nava Chameides to the IDF!